Alan Yeats, left, and Gary McCartan used virtual reality to create the best video game at Moray Game Jam. A virtual reality quest through a maze of levels was one of the big winners at a computer game design competition. More than 60 enthusiasts pushed themselves to the limit in a 48-hour test of endurance to devise a new hit for the shelves. Yesterday Alan Yeats and Gary McCartan claimed one of the top honours despite having just 10 hours sleep between them on classroom floors over the weekend challenge. The Abertay University students’ creation, Pocket Sized Guns, was chosen as the winner from a panel of industry experts at the Moray Game Jam. 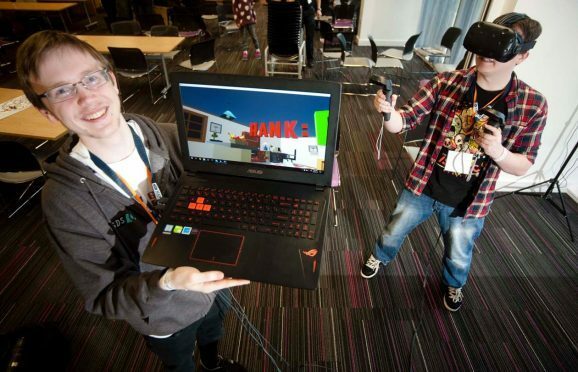 The duo won the computer game category at the Moray College UHI event, which featured virtual reality games for the first time this year. Mr Yeats, 21, revealed the secret behind developing a game for the new technology was to keep the entertainment simple. He said: “There are three different games in it, but broken down into different challenges. “You’ve got to shoot targets and get given a score. In some, you lose lives if you miss. After spending two days dreaming up the levels and coding the software the games were put to the test by industry experts at Moray College UHI in Elgin yesterday. Board games were also created with colourful designs scattered around the room based on a pirate map of islands and a spider’s web among others. Fife duo Alan Stewart and Martin Lumsden won that category for their card game entry entitled Jailhouse Break, which was based on hatching a plot to escape prison. The winners will receive a mentorship to help guide them into turning their creations into a commercial success. Judge Andrew Mulholland, co-director of Elgin’s Hunted Cow Studios, said: “The standard was probably the best we’ve had in the four years.